I was a guest for 8 days while I was attending a cooking school for the week. A perfect 30 minute walk to the heart of Dublin along a beautiful route. For when the weather was not cooperating or I was late getting out the door there is a bus every 10 minutes or less. Great location for exploring Dublin from.Lots of food options in area as well plus a Tesco express on the corner for any other needs. Everyone on the staff is very attentive and a treat to come home to each night. Rooms are comfy and very clean. The breakfast selection made it tough to decide what to have each morning. I wish I had a Donnybrook Hall everywhere I travel. I’ll be back again next year! Great family run place, very quiet for a big city b&b. They went out of their way to ensure my comfort and satisfaction . Right on bus lines, very near a taxi stand or they will call one for you. It’s now my address when in Dublin. We’ve just returned from a 2 night stay in the Donnybrook B&B in Dublin. It was amazing from the moment we arrived with it’s picturesque tree lined street to the welcoming view from the outside. Stepping inside we were so warmly welcomed by the owner Terry. He instantly gave his knowledge of the area and showed us on a map where to go and how to get places. That map was a godsend Our room was perfect with an en-suite shower room. Great small touches of lovely biscuits and a truly comfortable bed. The breakfast was gorgeous and plentiful. Fresh orange juice was delicious.Selection was great too.The 2 ladies who work there are always checking all is well and keep an immaculate B&B, always dusting, ironing, wiping down etc.Terry is a top fella, nothing too much trouble. I would definitely stay again when we go back to Dublin. Walk to the end of the road and turn left to the bus stop into the centre, costing 2 euros 55 each. Have the right change as they do not give change or allow the use of notes. We walked into the centre on our first day as it was sunny which took us about 30 mins and is a simple walk straight to the corner of St Stephen’s Green. We stayed in Donnybrook Hall in December and had a great time. The room was lovely and bright and very clean, Terry and his staff were very helpful and friendly. The breakfast was lovely and freshly cooked to order. Donnybrook Hall is only five minutes by bus from all that Dublin has to offer, there are some lovely restaurants in the area. 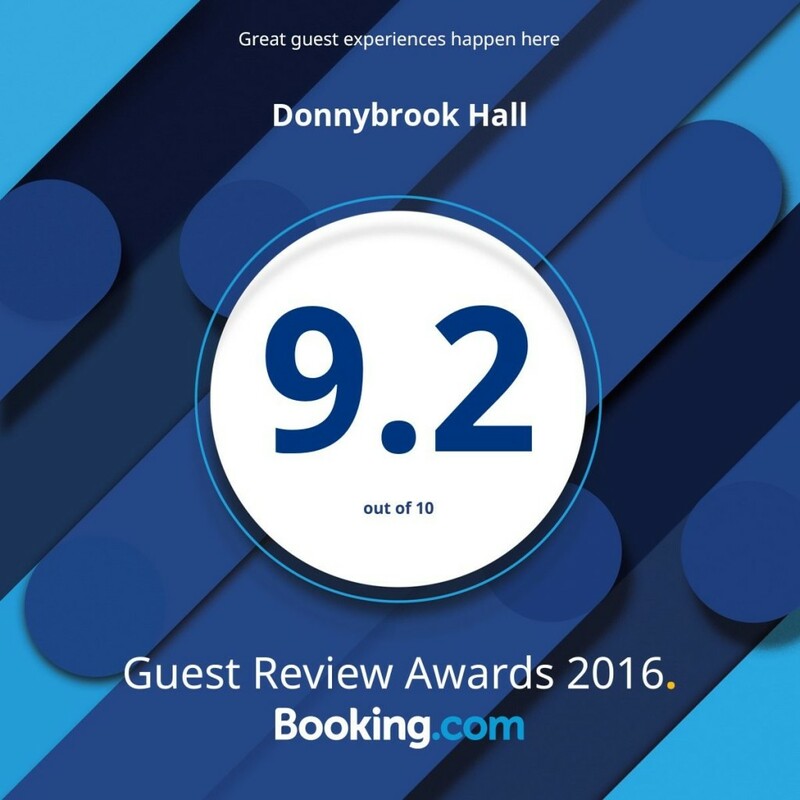 I am looking forward to going back to Dublin and I would definitely stay in Donnybrook Hall again. A really spendid place, quiet, elegant, efficient & friendly. So close to Donnybrook and the big advantage – around the corner from the airport coach drop off. Hope to be back again soon. Thanks a lot, everything was to our fullest satisfaction at Donnybrook Hall and we will surely recommend to our friends. Thank you so much for a lovely Irish Welcome.